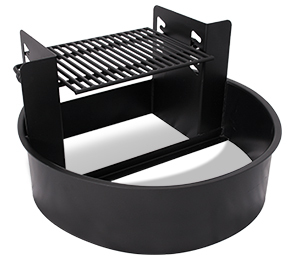 The heavy-duty campfire ring is developed with a permanent mounted grill, adjustable grate and 285 square inches of cooking space. The ultra-durable grate features attached non-conducive, cool coil grip handles to safely move the grate to 1 of 4 pre-configured cooking levels. Fire Ring Diameter - 30"
Constructed utilizing 7-gauge steel and a 1" safety lip, the 7", 9" and 18" fire rings are finished with a high temperature, rust-resistant, non-toxic black enamel paint. To ensure optimum safety, the Multi-Functional Campfire Ring comes standard with staple anchors for in-ground installation. 18" universal access model is available with or without an inner steel ring.